NN Burger’s signature burgers, “Freakshakes” and twister chips have become such a hit in the Northern Neck and Middle Peninsula, co-owners Jay Wolfson and Steven Sponder are ready to take their products to the next level, with national franchising opportunities. 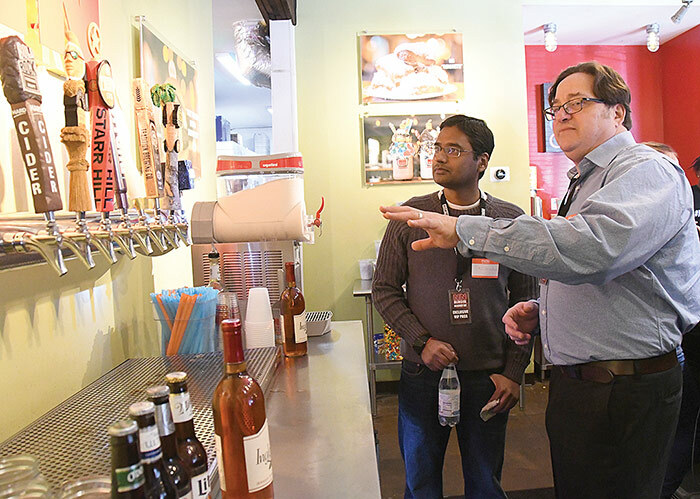 The NN Burger flagship location, 303 Queen Street, Tappahannock, hosted a Discovery Day January 26 and welcomed some 50 potential franchisees from Maryland, Fredericksburg and Richmond areas, said Wolfson. To date, NN Burger has had 110 applications for the franchise disclosure document, including about 70 from Virginia and Maryland, said Sponder. A number of requests have even come from as far as Sponder’s home state of Florida. Cousins Wolfson and Sponder opened Northern Neck Burger, 62 Irvington Road, in Kilmarnock in December 2013 and after a successful two years there, branched out across the Rappahannock River to Tappahannock and changed the name of both locations to NN Burger. “We have become so systematized in what we do anyway,” said Sponder, “that we felt we could easily expand what we do,” with franchise opportunities. Potential franchisees from Maryland, Ryan Holden and Rob Hanley were among the visitors at Discovery Day. Wolfson brings 30 years of restaurant management experience to his position and Sponder has owned nine restaurants. What they want to do is show others how to run a restaurant. The draw for customers like Holden and Hanley are NN Burger’s unusual and one-of-a-kind menu items versus the fast food varieties. Among the speciality burgers are the Sunrise Burger topped with a fried egg and bacon, the Bacon Blue Burger with Danish blue cheese and a balsamic sauce and a burger topped with lump crabmeat au gratin. New to the menu are the Top Notch Burger, a 1/2 pound Wagyu beef patty topped with black peppered bacon jam, sautéed portobello mushroom and roasted garlic truffle aioli, and the Over the Top Burger, topped with bacon and mini crisped potato sticks. Among the favorite sandwiches on Discovery Day was the Filet Mignon Oskar Sandwich, which included a filet mignon steak topped with lump crabmeat au gratin and hollandaise sauce. “We’re continuously adding to our menu and looking for new items,” said Wolfson. Items like their trademarked “Freakshakes,” which folks won’t find at a fast food restaurant. Wolfson and Sponder want the franchises to continue the flavor of NN Burger and not just in its sandwiches and speciality items. Ideally, the restaurant space should be between 2500 and 4000 square feet with outdoor patio seating. Like the Kilmarnock and Tappahannock stores, it should have rustic charm, a craft-brewery feel with casual dining. They also offer music at each location. NN Burger employs some 35 people in its two locations.